"Zanzibar is my home and it is a very special place for me," says Javed Jafferji, a Tanzanian photographer who is famous for his pictures of the beautiful Indian Ocean island. At his house down a narrow street in Zanzibar's crumbling Stone Town, Javed Jafferji has set up a publishing company with all the latest technology. It is just around the corner from his shop, the Zanzibar Gallery, which is crammed with dozens of books and postcards depicting idyllic beaches, traditional dhow sailing boats and fishermen bringing in their daily catch. "My family are from Zanzibar. My grandfather came here 100 ago and although I was born in Dar es Salaam, I decided to settle in Zanzibar," he says. In the background, there's a loud clanking noise from an air-conditioning unit. It is another hot, sultry day. "I love Zanzibar - and also Tanzania. There is everything a photographer needs. I enjoy taking photos of wildlife, the spectacular landscape and the people," he says. Javed Jafferji studied film and photography in the UK. He started his career as a paparazzi photographer, but he soon gave that up and decided to move to Zanzibar. He has published about 40 books, and he is excited about promoting tourism to East Africa. "I publish everything, ranging from coffee table books, postcards, diaries to brochures," he says. "I want to show the beauty of Tanzania and Zanzibar, so that people will be mesmerised. I hope my photos will encourage tourists to visit the island." And what makes a good picture? "I like natural shots, natural lights. I shoot in the early mornings or evenings, when the light is mellow and warm. "The photos attract the viewer, they make people say: 'Let's go to Zanzibar'," he says. But what does his family think about his choice of career? "Africa doesn't have a concept of photography," Mr Javed says, smiling. "When I told my uncles that I wanted to be a photographer, they said I was wasting my time. "For Asians and Africans, photography is limited to taking wedding photos. My uncles told me: 'You should be a man.' In the end, my parents were very supportive and I pursued the career that I wanted," he said. Despite the fact that many of his generation have left Africa, Mr Javed is determined to stay in Zanzibar. "The problem with Africa, is that many young people leave, especially all the creative people. Africa is full of potential. 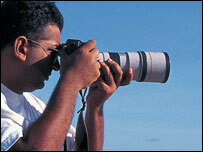 "I am the only Tanzanian-born photographer who is based here. I have put Tanzania back on the map of Africa." Mr Javed has lived and worked in Zanzibar for the last 10 years and during this time, there have been many demonstrations. Last October, there was another wave of violence following elections in the semi-autonomous archipelago. The unrest came as tensions between two rival parties, the ruling Chama Cha Mapinduzi (CCM) and the opposition Civic United Front (CUF) boiled over onto the streets. "Election time is always a period of turmoil. But the political situation is better now and I believe that the problems come and go," Mr Javed explained. He still enjoys travelling, although he says he always feels homesick when he leaves Zanzibar. "I can't stay away from Zanzibar for more than two weeks," he says. "I've worked in Europe, but I didn't like it there. "It's a nine-to-five lifestyle. Zanzibar doesn't have a concept of time. You work out your own pace of life on the island. Everything here is "pole pole", as they say in Swahili. It means "slowly, slowly."